Last week I shared and styled a sundress from Shein that was a total win- and today I have another great Shein find for y'all! 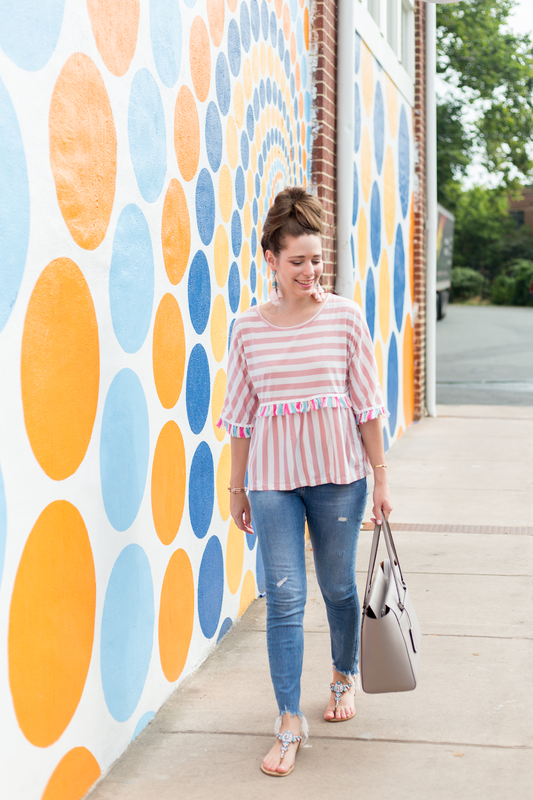 It's the most adorable top, and it's so perfect for late summer. Also chatting a bit about my blog's mission statement, and looking for your feedback! 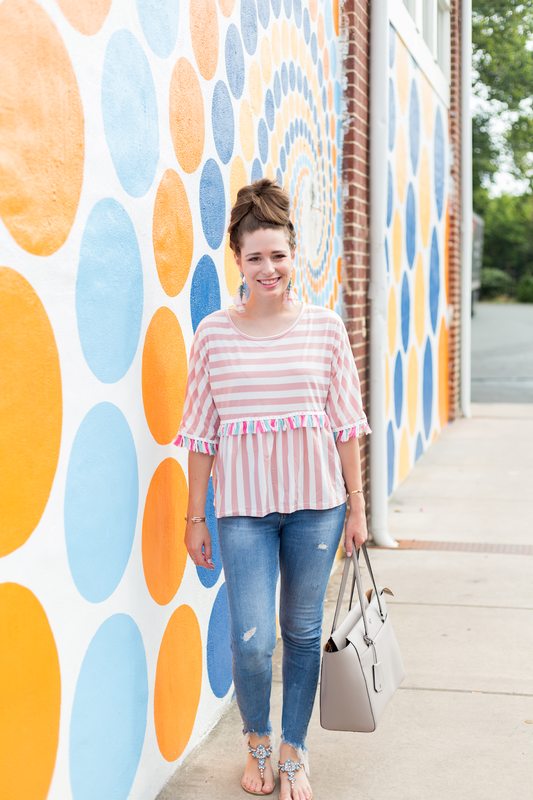 How cute is this striped tassel top?! Definitely another Shein win. I ordered an M, and it has a nice and loose relaxed fit on me. 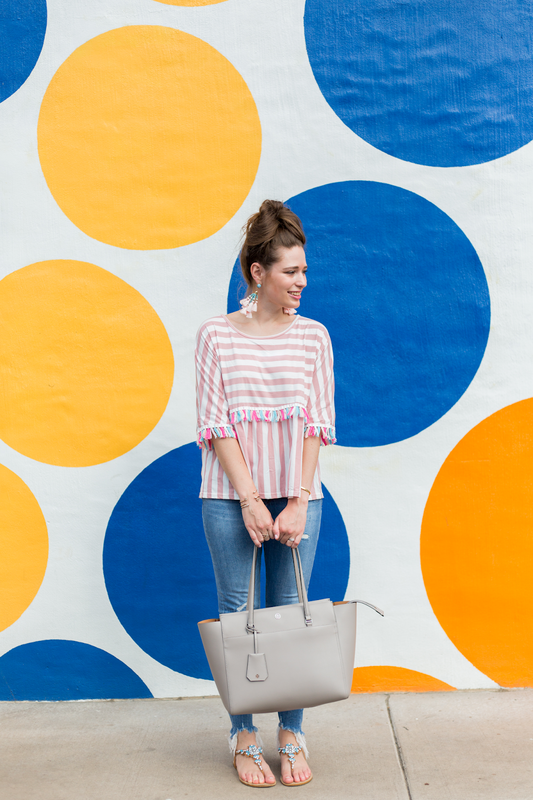 It's a great way to add a pop of fun to my late summer work outfits. I wore this exact look to work a couple weeks ago, and it was the type of outfit that brightened my entire day. For hair talk- I've recently started doing my messy buns a bit differently than I used to, and I love this end result! Plus- it's truly one of the most simple hairstyles. I found this type of messy bun tutorial through Emily at The Sweetest Thing in this blog post of hers!! So- I'd love y'all's feedback on something! 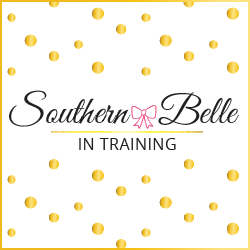 I never formally introduced this, but a few months ago I created Southern Belle in Training's first mission statement. 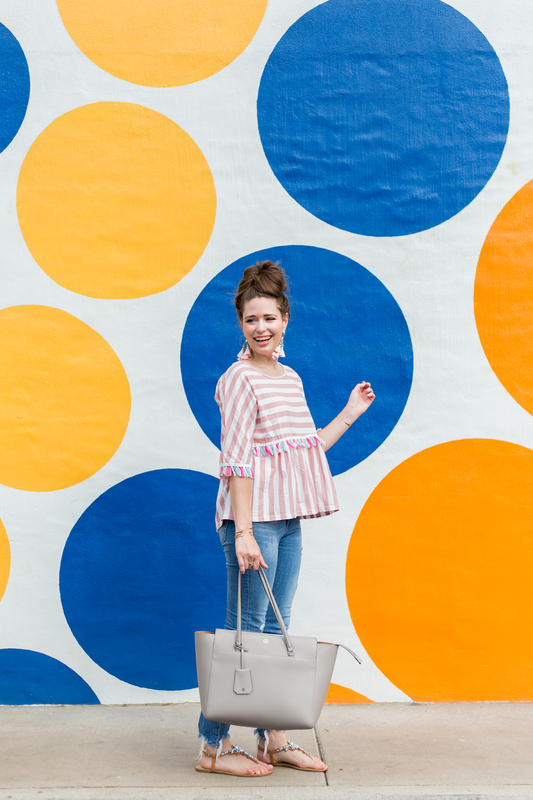 I figured that with my six year blogiversary coming in September, it was about time to do this! I have this listed on my Instagram, Twitter, and my blog's About page. My personal mission with this blog is to provide content that is "Affordable Fashion // Attainable Travel // Authentic Living." The first two are kind of self-explanatory- for "Affordable Fashion" I strive to feature outfits on my blog with affordable pieces, and I also enjoy regularly showing how I re-style things from my closet. A love of fashion can encourage someone to pursue materialism- but I want my blog and style to show that doesn't have to be the case! You can love clothes and all things girly and stick to a budget and not buy into every single trend. "Attainable Travel" is along the same lines. I love to travel and discover new places, but in my young 20s I know that I don't have unlimited funds to go on luxurious and exotic vacations. I want to show y'all how you can discover new places in your own state or region, and how when I do take bigger trips, I do them while being financially smart. The last part of the mission statement, "Authentic Living" - is the part that I'm still trying to figure out how to fairly represent in my blog posts and social media. This would comprise the posts on Southern Belle in Training that aren't fashion or travel related. Posts about my faith, career, and relationships. You might have read my Grocery Store Wars posts from this spring and summer- that's a perfect example of this topic. In my real life, I love grocery shopping and always have (every since I was little!). It's a mundane everyday thing that actually brings me a lot of joy, so I wanted to share that on my blog, even though it has nothing to do with fashion or travel. Another blog post series under this category would be my Relationship Monday posts where I talk about dating and singleness. The last time that I wrote one of these I lived in Vermont (and a lot of them were written back when I still lived in North Carolina! ), but it's a blog post series that I'd really like to start doing more often on Mondays again. My heart really lies in writing longer blog posts about personal topics. I am finally at a place in my life where I'm loving being single, but it took years to get myself in that mindset! I want to share more about relationship-based topics, and especially how my faith and morals play into how I view dating (and someday marriage). Love the idea of a blog mission statement, and I love how simple yet powerful yours is! This shirt is adorable. You seriously always find the best clothes! Loving the whole idea of the mission statement. I need to step up my blogging game, and you always motivate me to do so! I think it's hard to share authentically about life on social media in today's day and age. There's a pressure to always present ourselves to be perfect, so I think it is great that you are willing to share not only your best life but your whole life on the blog. Honestly, authentically living blog posts are some of my favorite to read and write. If you want to bounce content ideas off of me, I'd love to help a sister out! Omg this t shirt is super cute and so fun - I love it! The tassels on that shirt are so cute! I love the mission statement - for authentic living, it would be fun to see a mix of personal posts and also things like favorites, DIYs, dealing with tough situations, etc. What a cute tee, Annaliese! Also, AMAZING hairdo - you seriously have the most gorgeous hair!!! Loved learning more about your blog mission. All about some authentic living :) Keep up the amazing work!!! That is a great mission statement and it's definitely making me think about coming up with my blog's mission statement too! That shirt is so stinking cute, friend! And I love the mission statement that you crafted. I personally can't wait to see the pigeon series as part of your Authentic Living category but in all seriousness I love reading your more personal posts about you and what's important to you! This outfit is so you! I love your hair like that :) I love your authenticity and that your personality shines through in all of your posts. Keep doing you! I love your new mission! Affordable fashion and travel is something I strive for as well. How cute is this top?! Also, your mission statement is great! Your top is absolutely adorable and screams, "summer!" I've had some hits and misses with sizing w/ Shein, but I bet this would be okay! So cute! I love your mission statement!! I love reading your longer more personal posts too, but really I love all your posts, haha! Shein has some really cool pieces! Love the tassels. I also think it's so cool that your blog has a mission statement! Okay first of all that Tassle shirt looks incredible on you! Second, I love the idea of a blog mission statement. I may need to jump on this eventually!